Last week I shared insights into understanding the B2B lead generation model. 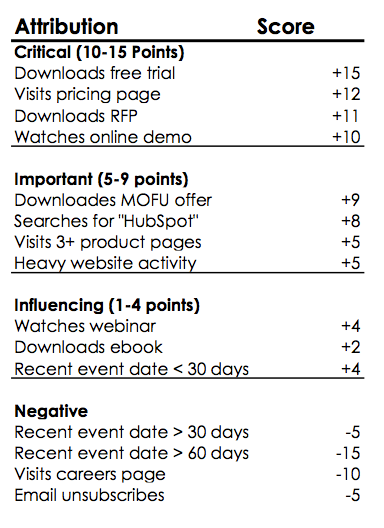 Today, I’m going to address a very hot topic in the whole demand generation world: Lead Scoring. The fundamental purpose and promise of scoring is improving the efficiency and effectiveness of the hand-off of a lead from marketing to sales. The promise of lead scoring is very powerful. By assessing attributes and behaviors of your various leads, you can create a score to determine which leads are better than others, and (theoretically, at least) to identify the optimal time to turn the lead over to your sales side. While the potential for lead scoring is great, the reality is that the vast majority of companies (especially small and mid-market (SME) B2B’s) are not ready for this approach, and would actually be hurt by the attempt to implement it. Most companies should consider taking a lead prioritization or lead triage approach. Choosing the right approach can be very valuable, as research shows that a 10% increase in lead quality produces a 40% increase in sales productivity. To identify what approach you should take you first need to understand how scoring works. Feel free to skip this section if you are already well versed in lead scoring. The first step to effective scoring is a clear understanding of who your customer is, and what attributes and actions contribute to or restrain the likelihood of making a profitable sale. Those attributes should be broken into explicit and implicit factors. 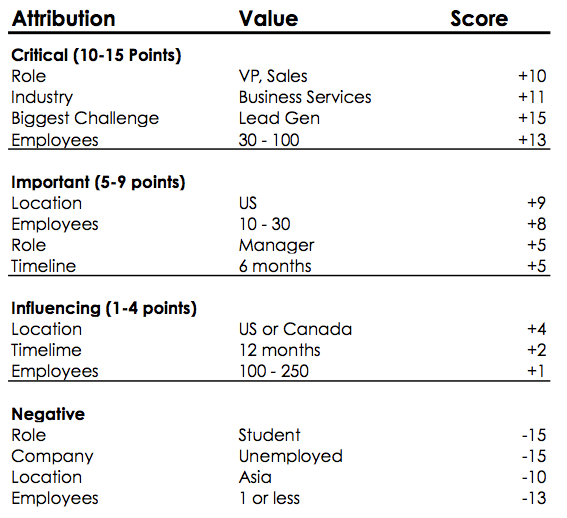 For example, if you’re targeting VP for mid-market companies, you would give more value to a lead from a VP than you would a manager. Additionally you would expect a company with 100 employees to be more valuable than a company with 10 or 500. Additionally, there are certain actions that people take that demonstrate a higher inclination to be ready to buy than other actions. For example, if someone requests a demo or an assessment, that would be a very high value action. Someone downloading a white paper would be less indicative of being ready to buy. With a clear point system in place, you are able to automatically calculate the value of any lead, and, theoretically, identify those leads that are the most likely to buy, and therefor you assign those leads to your salespeople and follow up appropriately. What Lead Management Approach Your Should Take? The first question you need to ask when determining your approach is do you currently have too many leads to follow up with? If you’re sales reps are drowning in leads and can’t keep up, then a full scoring approach is most likely your best approach. Now, most SMEs wish their problem were that they have too many quality leads to follow up with. The truth is that most B2B SMEs need to dramatically increase the number of leads they are creating. The good news is that a lead prioritization or lead triage approach is not only valuable for companies that need to increase their lead generation, it actually contributes to enhancing their results. I call this approach Lead Triage, as you are able to quickly and effectively apply the most effective strategy to each opportunity to increase the effectiveness. You can add even more power to the triage approach with Lead Prioritization. Lead Prioritization takes a piece from the scoring playbook. With this approach you identify 3 – 5 high value attributes or actions that are positive indicators for engagement. Using only those items you filter your leads to determine which leads to follow up with, and, more importantly, with what intensity and focus you follow up. For example, a CEO for a $25 million company, who has downloaded our Diagnostic Scorecard, our Core Sales Toolkit and looked at our pricing page stands out at the top of our prioritization. We would follow up quickly, with customized messages. Additionally, we would continue to follow up/nurture for an extended period of time. However, a marketing manager for a $1 million company who’s downloaded an article and attended one of our TOFU webinars would get a much less intense follow up sequence. In both cases (and many others), the thought process to identify what the best indicators are not only allows us to allocate our sales and marketing resources more effectively, they allow us to refine our message and approach so that it most effectively matches the quality of the opportunity and the experience the prospect desires.